The tournament will take place on Sunday March 8th 2015 at Edgbarrow Sports Centre, Grant Road, Crowthorne, Berkshire, RG45 7HZ England. 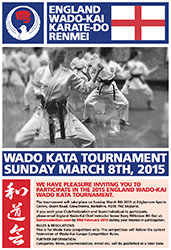 If you wish your Club/Federation and Team/Individual to participate, please email England Wado-Kai Chief Instructor Sensei Barry Wilkinson 8th Dan at: barrywado@aol.com by Mid February 2015 stating your interest in participation. This is for Wado Kata competitors only. The competition will follow the current Federation of Wado-Kai Europe Competition Rules. Times, accommodation, travel etc. will be published at a later date.